I have been greatly helped in this "Virtual Walk" by the National Library of Scotland who offer "This application that allows a set of historical map overlays to be viewed (against current maps)". Without this impressive research tool identifying long lost routes is unreliable or almost impossible. CE20 Pelsall Junction - 12 miles 7¼ furlongs from Horseley Fields Junction, Wolverhampton. Straight ahead over the footbridge to the Cannock Extension branch. Right to Brownhills. ( See Virtual Walks-3). taken looking West - 17/1/2014. Access from Pelsall via Nest Common on the left. over the footbridge to the right. CE30 Friar Bridge - at the start of Cannock Extension branch. Taken looking North from Pelsall Junction - 17/1/2014. Access from Pelsall North Common. Access from Pelsall via Nest Common and over the footbridge out of shot on the right. The sign indicates what was the plan for connecting a restored Hatherton Branch Canal to the W&E via the Cannock Extension branch. Due to various problems the LHCRT now plan that a connection to the W&E will be a little farther along the route to Wolverhampton. 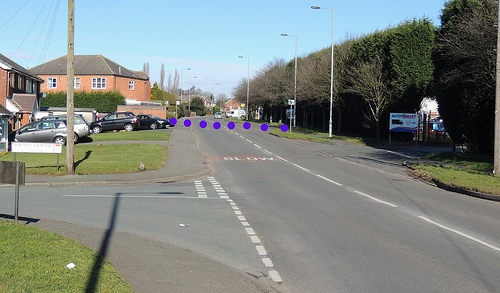 See Virtual Walks-7 Pelsall Junction to Lord Hayes Branch for more details. Access to and from farmer's fields only. CE80 Wyrley Common Bridge The canal narrows where a railway bridge passed over the canal. The mineral railway to Wyrley Common Pit ran to the right (east) and to Grove Collery and wharfs to the left (west). Access from public footpath to Lime Lane. 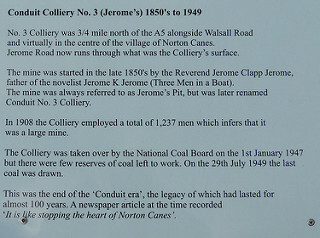 For Brownhills Colliery Grove Pit (Wyrley Grove Colliery). 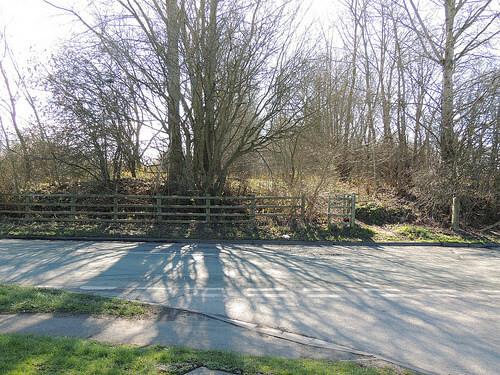 This was intended to be the start of the new route to the Hatherton Branch of the Staffs and Worcester, replacing the lost section that is described below. The early part of the new canal would have followed the line of the old tramway that delivered cable pulled coal tubs to the canal wharf. The Hatherton Canal is now expected to join the W&E via the Lords Hays Branch west of Pelsall Junction. See Virtual Walks-7 Pelsall Junction to Lord Hayes Branch for more details. Visit the Lichfield & Hatherton Canals Restoration Trust web site to find out about the Trust that was formed in 1988 and is a registered charity. 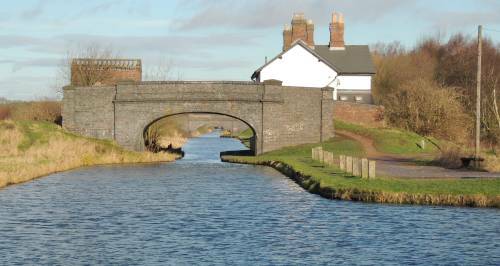 It campaigns for the restoration of the Hatherton Canal from the Wyrley and Essington, through the Cannock / A5 area to meet the Staffordshire and Worcestershire Canal at Hatherton Junction, Calf Heath. It promotes the restoration as public amenities for boating, angling, walking, cycling etc. and raises funds to carry out physical restoration work. This pit was connected to basins via cable tramway. The cableway ran from the basins to https://www.google.co.uk/maps pointer ---- 52.6586, -2.0015) A dead straight line of trees or overgrown hedging can still be seen along part of the route. Taken to the west of the basins - May 1990. 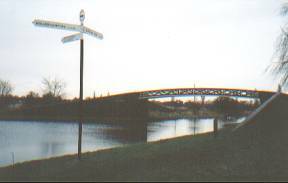 The old bridge (taken 2003). On the right the bridge dated 2008 with the remaining brickwork of the old bridge in front of it (taken 1/4/2009). Yates Brothers Boatyard - The site of the Yates canal empire that once consisted of a fleet of 400 boats. The site is now occupied by Norton Canes Boatbuilders and Denis Cooper's Canal Transport Services boat yard. In 1982 the boatyard of M.E. Braine Boatbuilders Ltd. on this stretch of the canal was used to film the BBC Play For Today Atlantis. The comedy drama, staring Frank Middlemass, was transmitted on 4 January 1983. It was about the conversion of an old narrow boat into a pleasure cruiser. The show ended with a sting in the tail when the boat started its first trip but did not get very far. Peter Terson (pseudonym of Peter Patterson) had written the play while he was living on a boat here. Does anyone remember the programme or Peter when he lived on the water here? 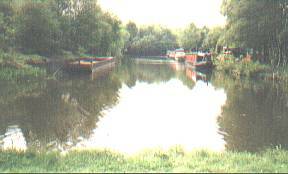 Viewed from tow path opposite (Access to boat yard premises from Lime Lane, near Yates Sports & Social Club) - photo taken 2/6/2007. - a reminder of the site of the Yates canal empire. Access from Lime Lane - no access to the canal tow path at this site. Just before the main road is the end of the line. Time to take a well earned rest on the bench carved in the shape of a canal bridge and look back up the dead straight canal. The line of the canal from the A5 Watling Street runs from top right to bottom left. 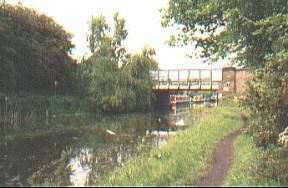 The canal would have passed under Norton Green Bridge or Nortongreen Bridge (now the west bound carriageway of the M6Toll) which took Albutts Road/Commonside over the canal. Photo taken from Walsall Road  looking south towards the A5 Watling Street. - 24/2/2016. CE180 Norton Green Wharf ? 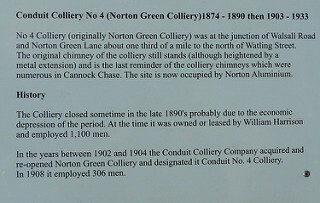 Was there a wharf here - or does "Norton Green Wharf" refer to the point after BCN House No.213 (see below) where the canal passes north of Conduit No.4 Colliery (Norton Green Colliery)? 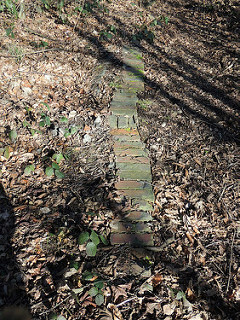 At various places the brickwork of the towpath edge can still be seen. To walk along the route of the canal from A5 Watling Street the a hiker, when reaching the M6toll, would have to walk alongside the fence by the motorway to Walsall Road - cross over the motorway bridge - and return via the public footpath from Walsall Road. 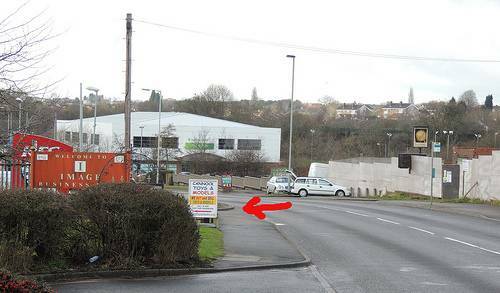 NOTE  walking to Walsall Road may not be possible and the first part of the public footpath may require forcing through the encroaching brambles! Once back on the line of the canal the going is easier. Photo taken looking north along the line of the canal from the M6Toll to Bettys Lane. - 24/2/2016. 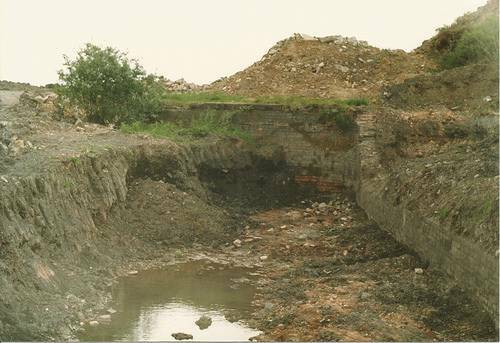 The remains of the abutments of New Road Bridge that passed over the canal. The bridge took a track south-east to meet Albutts Road/Commonside. Photo taken looking south - back along the line of the canal from Bettys Lane to the M6Toll. - 24/2/2016. Photo taken looking back south from Conduit Road where Bettys Lane (running from left to right) was taken over the canal by Foredrove Bridge. - 24/2/2016. 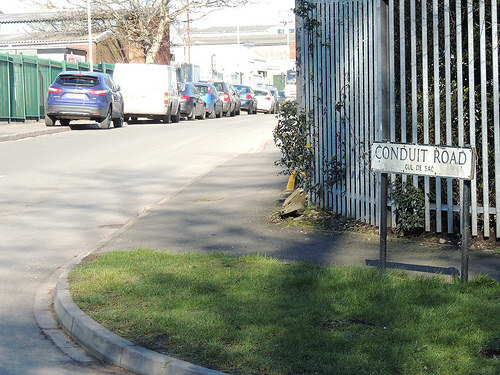 Conduit Road  named after Conduit No.3 Colliery (Jerome's) that lay at the end of the road and was served by canal basins that ran along the line of the right-hand side of the road for three quarters of its length. Photo taken looking north along Conduit Road from Bettys Lane (running from left to right) - 24/2/2016. At the junction of Brownhills Road and Burntwood Road, Norton Canes is a small park with some reminders of the mining history of the area. CE220 Norton Branch Railway (LNWR) - crossed over the canal. 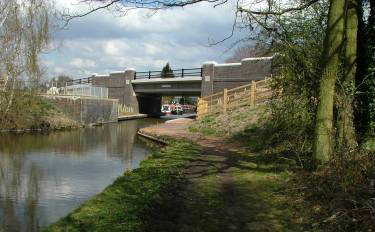 The canal crossed from right to left under Hednesford Road Bridge and running north-west, followed the line of Mere Croft (off Norton Grange). Just beyond the site of the crossing is Lock Keepers Close  the site of BCN house No. 213. 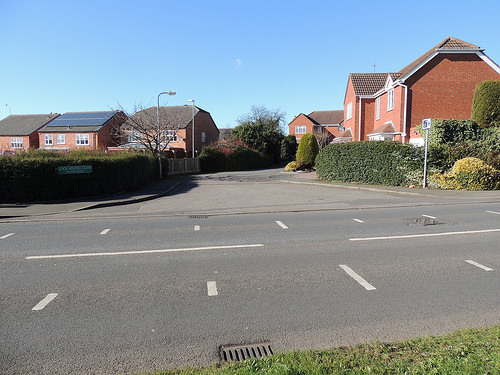 Photo taken looking north along Walsall Road at its junction with Norton Grange - 24/2/2016. On Walsall Road - probably at its junction with the new development called Lock Keepers Close. The canal cottage was probably on the site of the first house on the right. Was there a wharf here - or does "Norton Green Wharf" refer to a point near New Road Bridge (see above)? CE260 Norton Branch Railway (LNWR) - crossed over the canal - again. CE270 Norton Common Bridge which took Chapel Street over the canal. Norton Common Bridge took Church Road/Chapel Street over canal. 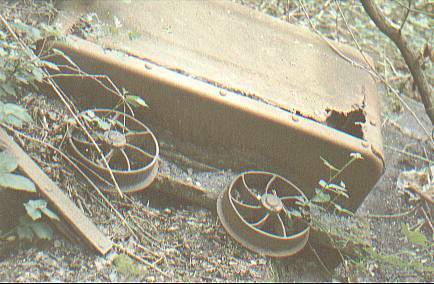 CE290 Wharf - for tramway to Coppice Colliery at Five Ways? CE300 Silvester's Bridge which took Norton Lane over the canal. 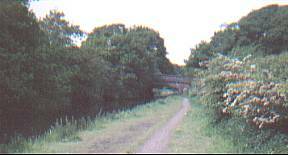 CE320 Kingswood Bridge (or Kings Wood Bridge) which took a farm track over the canal. CE330 Leacroft Wharf and railway (with tunnel) to Cannock and Leacroft Colliery. CE340 High Bridge took Washbrook Lane (Leacroft) over the canal. See Virtual Walks-8 Churchbridge Branch Canal for more details. CE370 Rummer Hill Bridge took what has now become York Road over the canal. At this point the canal joins the line of the A460 Eastern Way. CE380 Leacroft Bridge took Mill Green over the canal. Leacroft Bridge took Mill Green over the canal. Now under the A5190 Lichfield Road island with A460 Eastern Way. CE390 Park Bridge - a footbridge passed over the canal. CE410 Rail bridge - LNWR Norton Extension Branch passed over canal. The point where the canal leaves the line of the A460 Eastern Way. CE420 Hemlocks Bridge took a farm track over the canal. Currently a cul-de-sac of Hyssop Close. Ordinance Survey map of the 1880s showing Hednesford Basin, the Globe Inn and East Cannock Colliery. The "current" pub "The Globe in Hednesford" has little left apart from its sign. a larger map is available via Flickr. 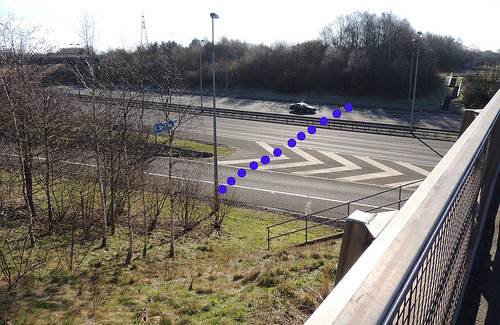 The footpath leading toward the site of Hednesford canal basin is on the left (see red arrow). 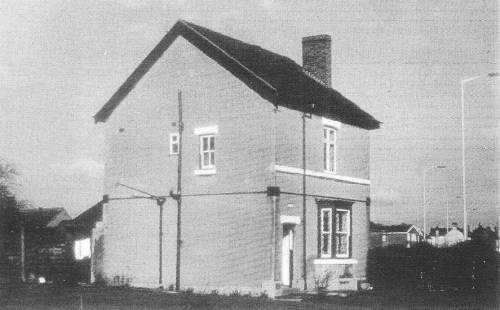 To the right are the remains of the Globe pub behind the pub, farther to the right, was East Cannock Colliery. Taken from the A460 Old Hednesford Road  looking towards Cannock. - 10/2/2016. CE440 Hednesford Basin Wharf (East Cannock Basin) - start of. May 1984  the last days of Hednesford canal basin. I believe the two houses are BCN Houses No.215 and 216. In the background to the left are the stepped rooflines of workshops that still stand in Chaseside Drive. CE460 Hednesford Basin Wharf (East Cannock Basin) - end of. May 1984  the last days of Hednesford canal basin.